Jim Sullivan, the son of John Sullivan, has officially confirmed that seven years after his father’s death, the writer’s much loved creation is making a return, but not in the way you might have imagined! It came out recently that John Sullivan – who wrote every single Only Fools and Horses episode himself – actually had plans to pen one more episode that would have seen Del and Rodney return to Nelson Mandela house and would have seen the old gang back together. John Sullivan got his start with the BBC when he wrote the sitcom Citizen Smith, starring a young Robert Lindsey, which garnered a great deal of success, and from there he was given the task of writing another sitcom for BBC, which eventually became Only Fools and Horses. John Sullivan is credited by many who worked on the show as being one of the finest comedy writers of his generation. But it could be argued that such was his deftness and skill at seamlessly blending comedy and tragedy, in the old Greek tradition, there is a case to be made that John Sullivan was one of the finest writers of his generation, full stop. And like all the great writers, John Sullivan’s secret was not a secret at all, but a golden rule by which all the great authors and screenwriters abide, which is to simply write about what you know. He was a Londoner through and through, and even described himself as being a bit like Rodney when he was a teenager too, as he too was a starry eyed dreamer. Sullivan also said that Del Boy was more of an amalgamation of many characters he encountered growing up in South London. The farewell show was planned before tragically John Sullivan tragically passed away as a result of pneumonia back in 2011, but now his son has given us all the news that we hoped one day we might get to read, and that is that Only Fools and Horses is making a comeback of sorts. John Challis – who played Boycie in Only Fools, said that Sullivan was unable to finish to script before he died aged just 64, and that it would have aired as part of the show’s 30th anniversary celebrations. Challis told the Daily Star: “Just before John died he was actually getting together a special for us. “It was going to be Del Boy’s 65th birthday – for which everyone would meet at The Nag’s Head – and retirement. But now, after it seemed as though all we would be left with was the memories and reruns on Gold, it has been confirmed that Only Fools and Horses is returning as a stage play. The Daily Mail reported that the classic sitcom, which was voted the greatest ever by the viewers of Britain, is to be turned into a West End stage play. The show will apparently be written by John Sullivan’s son, Jim Sullivan, as well as comedy veteran Paul Whitehouse, who starred in iconic shows such as The Fast Show and the Harry Enfield shows. While the characters of Rodney and Del Boy will feature, it has been reported that Nicholas Lyndhurst and Sir David Jason will not be taking part – leaving the parts open to be recast and re imagined. 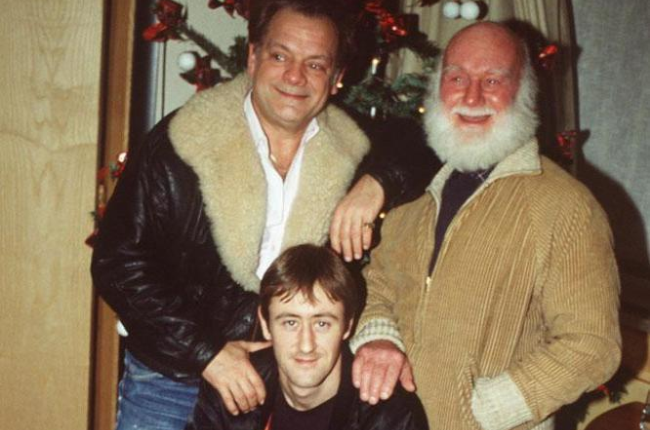 Only Fools and Horses ran for seven series from 1981 to 1991, alongside 16 Christmas specials. Taking to the official Only Fools and Horses Facebook site, Jim Sullivan posted a message to all the Only Fools and Horses fans out there that were clamouring for news and updates on the stage play, which is reportedly slated to open early next year. “Seriously though, I just want to say a few things to all the Only Fools fans out there. “First off, I want to say a big thank you to you all for your continued support of the show. I am constantly taken aback and warmed by the love for the series and the characters my Dad created all those decades ago. It has been seven years since my Dad passed away and while the road since has been pretty bumpy, the passion and kindness of the fans has remained steadfast and strong, and us Sullivans truly appreciate that. “I also want to tell you that there is an Only Fools and Horses Musical on the horizon. Back in 2010 my Dad had been toying with the possibility of a stage show but sadly didn’t get the chance to commit to it. In 2015 we met with the producer, Phil McIntyre, and agreed to develop the idea. “Soon after that, Paul Whitehouse came on board and things have been bubbling away ever since. I am very pleased and excited to say that the show will be launching early next year (not ‘this time next year’, early next year). I can’t say too much more at this stage, only that this will be the official, i.e. genuine, i.e. creme de la menthe Only Fools and Horses Musical. “I say this because I know there are quite a few unofficial and completely unauthorised live ‘Only Fools’ shows doing the rounds, and I want you to know what’s what. “So, come next February, if you fancy a kosher trip down memory lane, a pukka laugh and good old knees-up with the Trotters and co, keep your eyes peeled for the official Only Fools and Horses Musical. “You know it makes sense. If you’re now wondering why Nicholas Lyndhurst has decided against reprising his classic comedy character, then you might be able to ask him yourself if you have the money handy to move next door. Recently, a seaside mansion costing £4.5 million became available in the exclusive coastal village of West Wittering, West Sussex. This would be a dream come true for any Only Fools and Horses fan, because not only would you be living in one of the most desirable locations in England, but you’d also have Nicholas Lyndhurst for a neighbour, who has lived in the high-end location for 20 years. The seven-bedroom Wittering mansion is two doors down from the celebrated actor, and was bought by the current owners in 1996 for £340,000, and have since renovated the property to a luxurious standard, and have also seen West Wittering become a highly sought-after location, with a host of celebrities calling it their home. Overall, they have made a tidy profit that Del Boy would be proud of, as the value of their property has risen 13 times greater than that for which they bought it. Other famous people who own homes in or around the village include actress Kate Winslet, The Rolling Stones’ Keith Richards and singer Michael Ball. Wittering House is on the private road that is said to be one of the most exclusive addresses on the south coast.